Animal welfare charity Viva! scores another victory in their long-standing kangaroo campaign as companion animal supplies retailer Pets at Home discontinues the sale of dog treats that contain kangaroo meat. Viva! contacted Pets at Home after an animal advocate reported seeing kangaroo meat dog treats on sale. Pets at Home CEO Peter Pritchard responded positively, confirming that as the treats do not meet their ethical standards, they would discontinue sales. Pets at Home stocked two variations of the 100 per cent kangaroo meat strips which were marketed as grain and gluten-free, “natural” high-quality dog treats. However, what the original suppliers JR and Hollings failed to mention is that consumers would be unwittingly buying into the largest slaughter of land-based wildlife in history. The kangaroo meat industry is one of the most brutal and violent in the world. Kangaroos are hunted at night with powerful four-track vehicles. Mesmerised by powerful searchlights, the startled animals are supposedly shot in the head but many are miss-shot and die a slow, agonising death. Baby kangaroos are pulled from their dying mother’s pouch to be clubbed to death, whereas dependent adolescents are shot and dumped or left to die from predation or hunger without the protection of their parents. Although no statistics are currently available on the number of wounded animals the Australian RSPCA estimates that 100,000 adults are inhumanely killed with some temporarily surviving with horrific wounds, such as shot off jaw]. It is a common misconception that kangaroos are farmed animals, they are completely wild. Since kangaroos are a slow-breeding marsupial with low reproductive rates wildlife experts are concerned that turning them into just another commodity is not only cruel but also unsustainable. 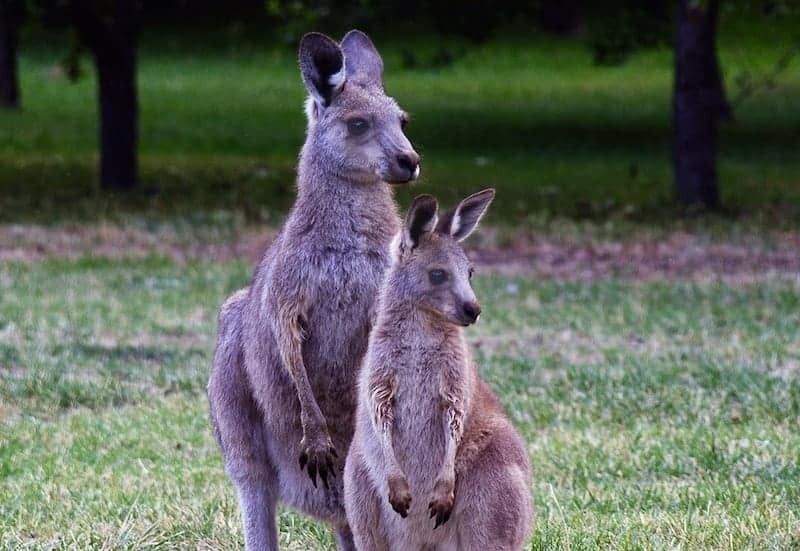 In addition to serious animal welfare concerns around kangaroo meat, experts from both the UK and Australia have expressed concerns about the health implications of consuming kangaroo meat, warning that the meat could be “riddled with pathogens”. Five years ago, independent testing found dangerously high levels of salmonella and E. coli. In 2014, dog treats made from kangaroo meat were withdrawn from sale because of salmonella contamination, putting not only our companion animals at risk of illness but also jeopardising anyone handling the contaminated products. Viva!’s victory with Pets at Home comes during a period of extreme drought in eastern Australia. The kangaroo industry claims that the current lack of food and water caused by the drought has increased competition between kangaroos and livestock. In response to worsening conditions, the New South Wales government has removed many of the regulations protecting kangaroos. Landowners now have easier access to shooting permits – applying over the phone instead of in person. Many hunts will go unchecked as farmers will no longer have to tag dead kangaroos to keep a record of numbers killed. These policy changes will have devastating effects on the kangaroo population, rapidly increasing the number of kangaroos being needlessly and ruthlessly killed. Viva! have campaigned against the sale of kangaroo meat for more than two decades and have achieved numerous successes in removing sales from Tesco, Sainsbury’s, Morrisons and – most recently – Iceland and Lidl. Their campaign has resulted in all UK supermarkets are now being kangaroo free.